The immense beauty of the Canadian Rockies is home to a huge natural reserve, which is one of the most important for the planet. These lands are the scenic spot of the oldest national park in Canada - Banff National Park, which has existed since 1885. Banff since 1984 is included in the list of World Heritage Sites by UNESCO because of the majestic mountains and landscapes, glaciers, lakes, waterfalls, canyons, limestone caves and fossils, found here. One of the things that must be seen in Banff, is the emerald Lake Louise. Glacial in origin, Louise is located within the Canadian state of Alberta, about 5 kilometers from the village of Lake Louise and the Trans-Canada Highway. Against the background of the bluish, crystal clear waters of Lake Louise, stand the striking views of the majestic Victoria Glacier, which is considered one of the most inspiring views in Banff. 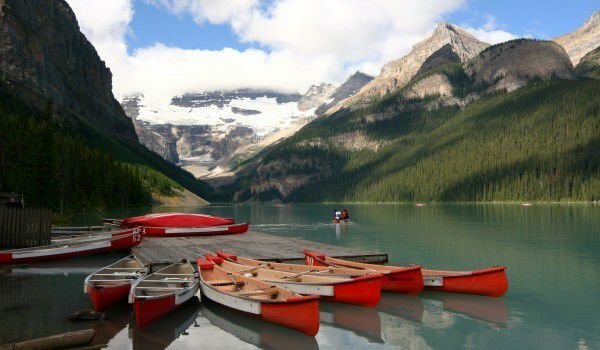 Among other interesting lakes, which can be found in Banff National Park and Jasper National Park are the favorites of many people, called Bow Lake, Hector Lake, Peyto Lake, Mistaya, Waterfowl Lakes, Chephren, Sunwapta and, of course, the lake with sky blue waters - Louise. Louise can be easily reached by Highway 93, where a designated road leads to the lake. Lake Louise is so beautiful that it seems quite unreal. Its waters are fed by the glaciers above, mainly Victoria. The emerald waters are due to rock flour, which is separated and precipitated from the water of the melted glaciers. The total area of the lake is 0.8 square kilometers, as Louise is drained by the 3-mile Louise Creek, which in turn flows into the Bow River. Lake Louise is named after Princess Louise Caroline Alberta (1848-1939), the fourth daughter of Queen Victoria and wife of the Marquess of Lorne, which was the Governor General of Canada between 1878 - 1883. On the shore of the beautiful turquoise lake stands the Fairmont Chateau Lake Louise, a little hut and a Deer Lodge. These are the only places where one can stay in Lake Louise, and the only places where you can eat something. Prepare to lighten your pocket if you decide to stay at the chateau, because in it have stayed some of the most famous politicians, artists and businessmen on earth. The mountainous hills around Lake Louise in winter are an excellent place for skiing. Here is one of the best and most beautiful ski resorts in North America. As one of the most beautiful ski destinations, it has three separate ski areas, running a total length of 50 kilometers. Also in winter, the lake surface freezes and Louise is perfect for riding ice skates. Annually, Fairmont hotel makes a beautiful ice castle, which adds charm to the snow fairy land.